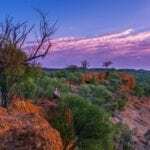 Once upon a time, when dinosaurs roamed the land, Outback Queensland resembled a landscape more telling of a temperate forest than the dusty plains it’s known for today. 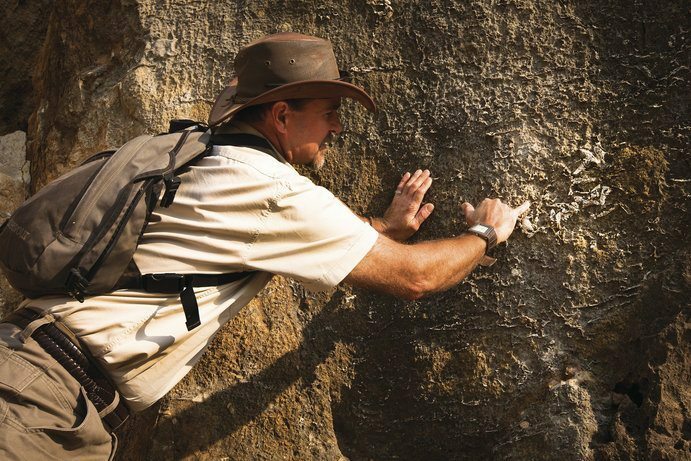 Fast forward 95 million years and scientists are slowly piecing together the bones of Outback Queensland’s history. 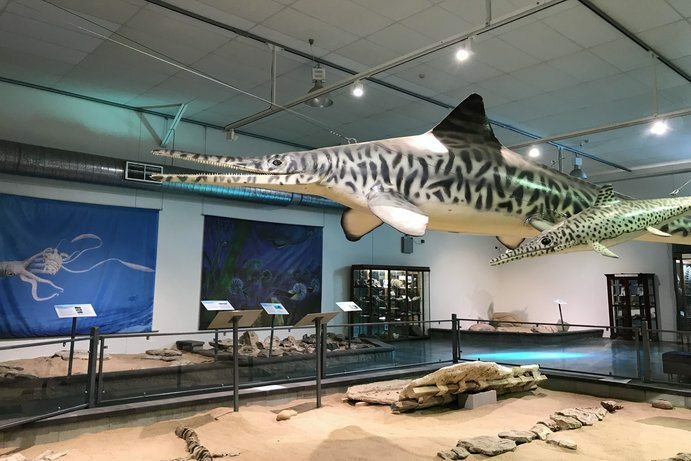 Become mates with ‘Krono’ the Kronosaurus queenslandicus and ‘Wanda’ – Australia’s largest fossilised fish at Kronosaurus Korner in Richmond. Back when these two dinos roamed the land, there was an inland sea – even though the red dirt covering the town makes it hard to believe. Step back in time with a theatre presentation that brings the long-gone watering hole and prehistoric creatures back to life. Home to not just the largest prehistoric marine creatures and fossilised fish, Kronosaurus Korner also has what’s considered one of the best-preserved dinosaur skeletons. You can see palaeontology in action and witness fossils being prepared in real-time through the glass window into the preparation laboratory. Shiver with Jurassic Park levels of spine-chilling eeriness as you spot 3,300 giant stone footprints at Lark Quarry Conservation Park. Take off 115km south-west of Winton to learn about the world’s only recorded evidence of a dinosaur stampede, dating back around 95 million years ago. This extraordinary piece of Australian dinosaur history occurred when up to 150 carnivorous dinosaurs were stalked by a meat-eating enemy of the dinosaur world. Spooky! Your jaw will meet the floor at the Australian Age of Dinosaurs, which houses the world’s largest Australian dinosaur fossil collection. 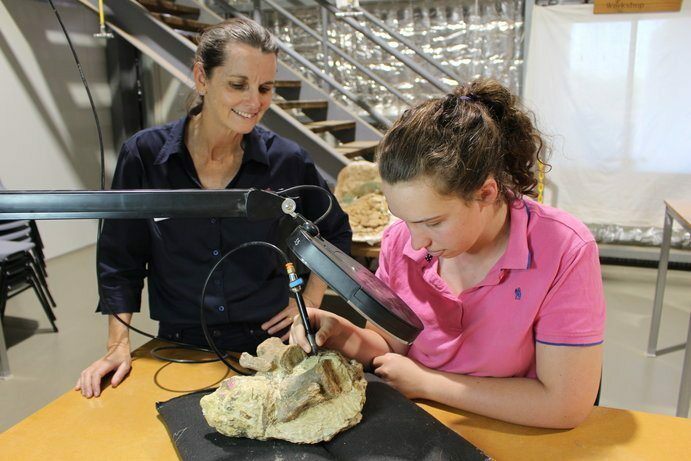 Track 12km from Winton to see the dinosaur fossil display and working laboratory where you can see the bones being cleaned by volunteers. The Museum also offers an extended seven day exploration dig for those seeking a more in-depth experience and dinosaur encounter. Don’t forget to wander through the collection room which is home to Banjo and Matilda, two of Australia’s most complete dinosaur skeletons. For a walk on the wild side, trek through Dinosaur Canyon where life-like dinosaur replicas can be spotted in their natural habitat. Meet Cooper, the friendly giant dinosaur. He’s quite the famous giant too – one of the world’s largest dinosaurs, and certainly the largest in Australia. 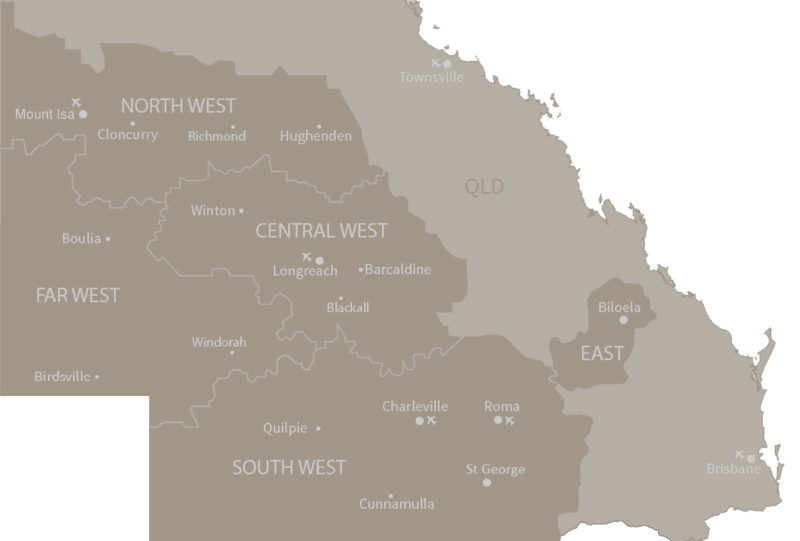 You can meet the 95-98 million year old Titanosaur at the Eromanga Natural History Museum (ENHM), nestled in the south-west pocket of Outback Queensland. Not only does the museum have dinosaurs but it’s got some of the world’s largest mega fauna and a variety of micro fauna thought to be 50,000 to 100,000 years old. You’ll be yelling Crikey! at the Outer Barcoo Interpretation Centre in Isisford (about an hour south of Longreach), with its life-sized replica model of a Isisfordia Duncani. This old girl won’t bite – but being the evolutionary ancestor of the crocodile, you can imagine she had some bite 98 million years ago. If you’re not croc crazy, take a look at the 100-million-year-old Bulldog Fish and the displays of local fauna, flora, reptiles, birds and fossils from the region. 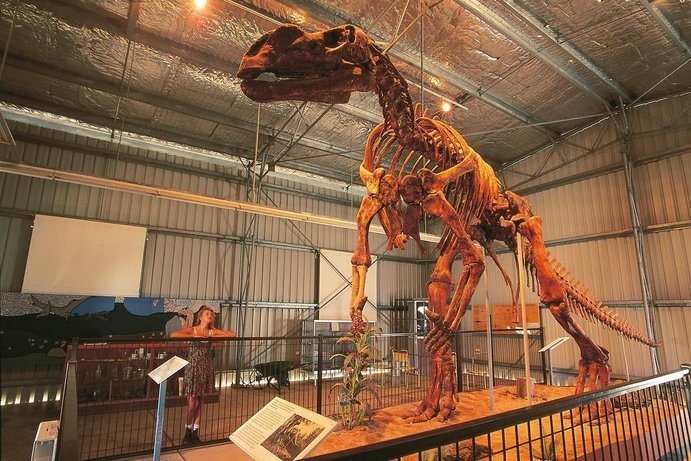 A trip to Hughenden isn’t complete without visiting its most famous local – Hughie, a life-sized skeletal Muttaburrasaurus. You’ll find him at the Flinders Discovery Centre and Museum, where you can also explore impressive international fossil collection, interactive displays, and Australian dino bones found in the area from 1865 up until modern day digs. 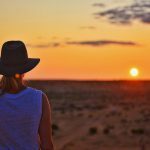 As one third of the triangular dinosaur trail of Outback Queensland, fill your weekend with the prehistoric giants and try this itinerary on for size. Skip the museums and head straight to where nature and history come together – the World Heritage-listed Riversleigh fossil deposit. As the richest, one of the most extensive and important fields in Australia, this is one fossil site you’ll want to uncover. 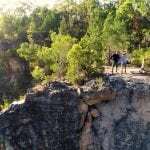 Found in the southern part of Boodjamulla (Lawn Hill) National Park, the Riversleigh section covers 10,000 hectares, however only a small portion (Site D) is open to the public. Preserved in limestone, some fossils date back 15-25 million years, providing insight into the mammal evolution. Discover the ancestors of our native wildlife, from the largest freshwater crocodile to feather-tailed possums and kangaroos with sharp teeth. P.S. Plan your trip around the annual fossil dig each July for an extra special encounter. Each year the dig continues to uncover prehistoric animals previously unknown to science – you never know what might be discovered. 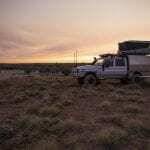 Have you had a dino encounter in Outback Queensland? What did you see? Stayed in Richmond a few days on the way to The Big Red Bash. Kronosaurus Korner or KK as the locals was a great place to explore. So much information on a great subject. The tour of the museum by the curator was excellent and the fossicking tour in the afternoon was great fun. Everybody found some fossils. Make sure you stop there. You can’t miss the giant Kronosaurus on the corner.